In the last post, we decided to take a small detour away from immediately building big rovers. 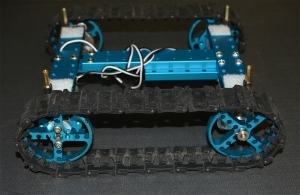 So today let’s tackle this exercise of creating a small-scale RC-controlled rover as an introduction for future efforts. Since we’re going to be building several rovers on this journey (increasing measurably in size and complexity), it’ll simplify our conversation to give each of them a name. Let’s have an engineer-as-your-marketing-director moment and give it the flashy name of Rover 1. 1. Arduino — First up, you’ll want an Arduino. If you’re reading this blog, you’re likely familiar with this humble, market-creating palm-sized computer. 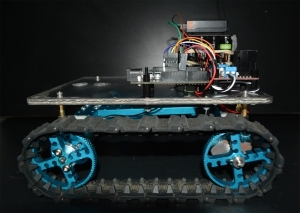 Released in 2006 as a $30 open source single board microcontroller, the Arduino ecosystem has since exploded with dozens of permutations of the small computer, each with various features and form factors. As the Arduino platform has matured, it has significantly lowered the barrier to entry — both in terms of cost and complexity — for interacting with the physical world. 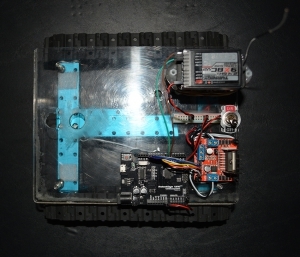 We’ll be using the Arduino UNO R3 — here’s the exact Arduino you see in the pics. You’ll likely be just fine with any Arduino you purchase from a reputable merchant. 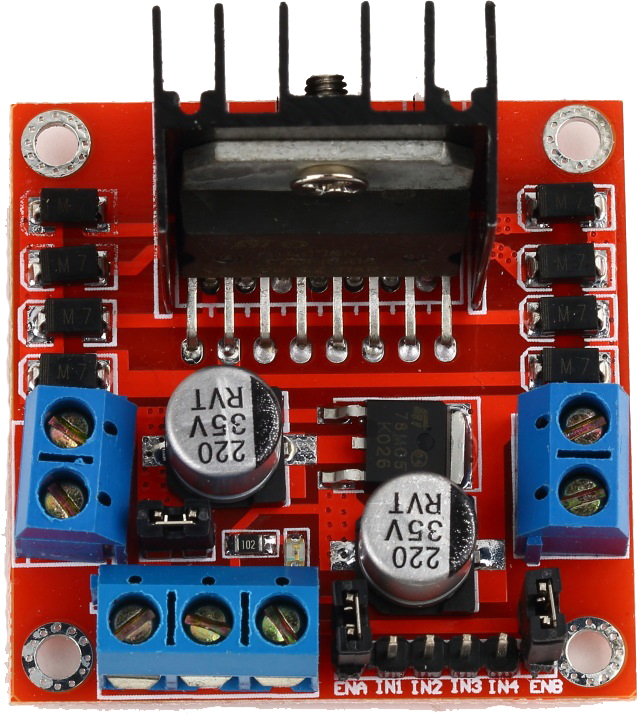 Current prices on Amazon are around $20 for a genuine board (made by the folks who created the Arduino) or $10 for a knock-off. If you don’t mind waiting for the boat from the Far East, it will only set you back ~$5. 2. 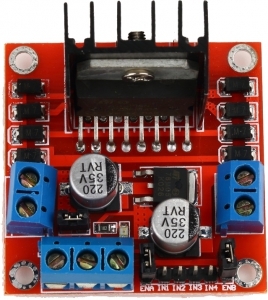 L298N Dual Motor Controller — The L298N is a standard cheap solution for controlling two small motors with your Arduino. You can pick it up for around $2 on Aliexpress or get it fast for around $7 via Amazon Prime. 3. 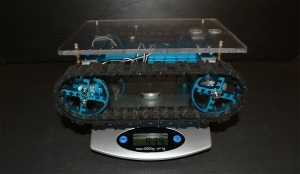 Radio Transmitter / Receiver — We’ll use a standard RC radio to control Rover 1. I’ll be using an old Turnigy 9x that was laying around the shop — if you don’t have a radio, you can save cash and should get identical performance from either the FlySky 6 channel or 3 channel radio. 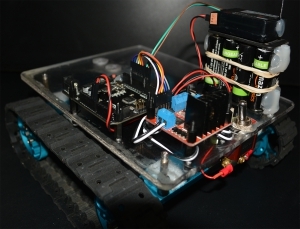 If you’re new to robotics, when we talk about the number of channels that a radio has, we’re talking about the number of distinct controls that the radio is capable of transmitting. 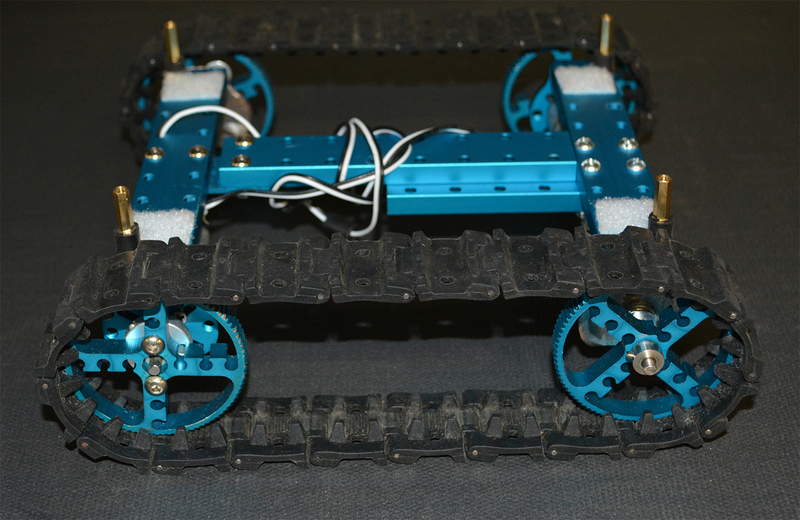 For Rover 1, we’re using just 2 channels — one for speed and one for steering. Current market prices for the 9/6/3 channel radios are ~ $70/$50/$30, respectively. 4. Anti-Vibration Mounts — If you’ve ever replaced a car’s radiator, you’re likely familiar with mounting on rubber bushings. With radiators, you’re trying to reduce the vibration to prevent cracking. With autonomous robots, we’re primarily trying to shield the IMU from performance-degrading vibration. Here is a list of mounts on eBay like those we’re using — price-wise, you’re looking at 50 cents a piece. Notice what we use M3 sized stainless hex bolts to bolt through the polycarbonate sheet. 5. Polycarbonate Sheet — For the mounting surface, we cut up an old sheet of .25″(6.4mm) polycarbonate to 8.5″ x 6.5″ (216mm x 165mm). The main non-obvious consideration for your mounting surface is to choose something non-magnetic. If it’s magnetic, you don’t want it close to a compass. Aluminum is great, stainless steel (i.e. Type 316) may work, but keep in mind that not all stainless steel is non-magnetic. You can pick up a sheet of polycarbonate like we used on eBay for around $10. If you order a big sheet or higher quantity, you’ll drive down that cost per unit considerably. 6. 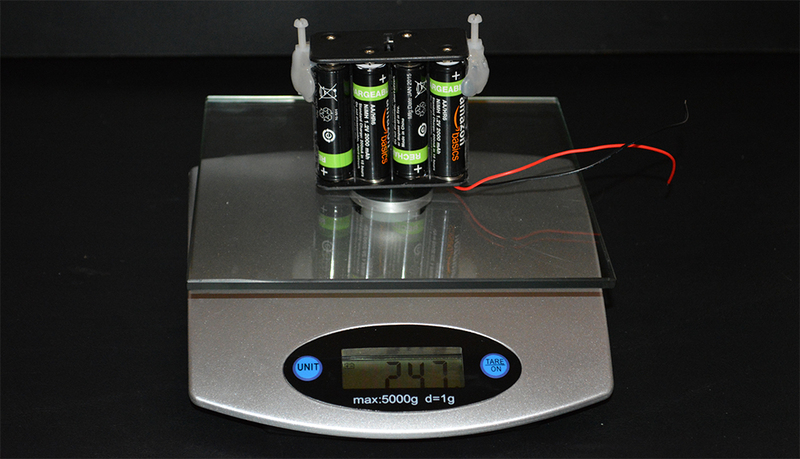 NiMh (Eneloop) Batteries — There are far better batteries if you’re seeking an optimal power-to-weight ratio. If you don’t have a set of AA NiMh batteries laying around, you won’t regret springing for the purchase. If you’re still using AA/AAA alkaline batteries for high-drain devices and throwing them away, it’s time to step into the light of good rechargeable batteries. Check the reviews: NiMh rechargeable batteries are NOT the old school rechargeable batteries that died quickly, had “memory” issues, and were a general thorn to enjoying life. 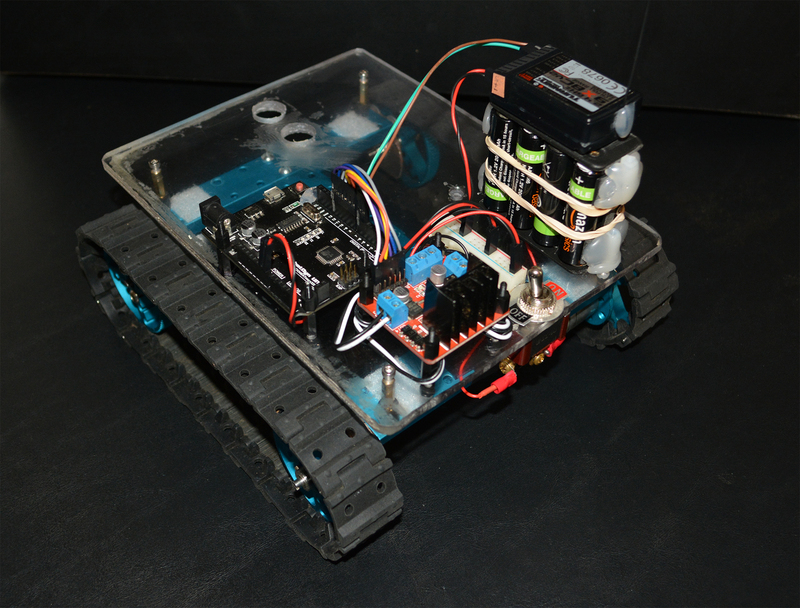 NiMh batteries work fine in this application because Rover 1 won’t draw much current — it won’t be winning any races. As far as which brand to use — I’ve had good luck with both Amazon Basics and Eneloop. You can pick up a NiMh AA 8 pack for around $15. You’ll also need an NiMh charger — spring $10 and you’ll land a cheap one that should work fine. 7. 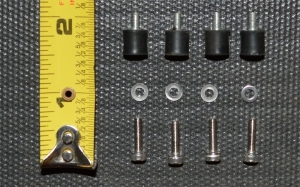 Eight Place Battery Holder — We’ll use a generic battery holder that can you buy for around $2. This holder connects all 8 batteries in series. 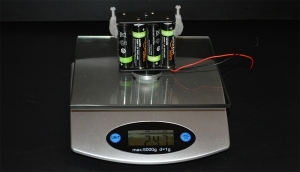 Note that NiMh batteries are rated at 1.2v instead of the traditional 1.5v. So the voltage for our battery pack is 8 x 1.2v = 9.6 volts. Notice in the picture above that we hot glue a threaded nylon spacer to either side of the batter pack. This will make mounting the battery pack super easy. 8. 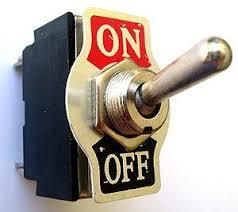 On-Off switch — We use the fancy Eaton switch. 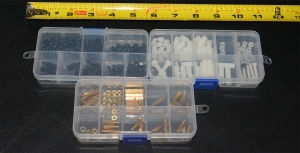 Really these are commodity items and you can grab a cheap 5 pack of generic heavy duty switches for under $5. I highly prefer this old-school metal switch to the new-fangled plastic switches. 9. 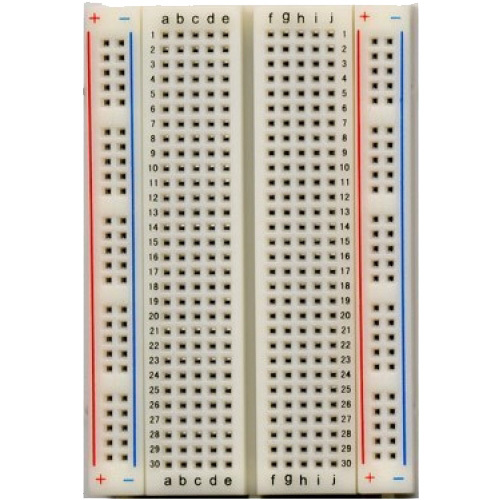 Wires — I like to make my own wires & connectors to keep things looking clean, but if you’re wanting to get started quickly, Amazon will happily rush you a pack of breadboard wires for $8. 10. Breadboard — You’ll notice in the Rover 1 pictures that I ripped the power rail off a breadboard and created a long 5v power supply. 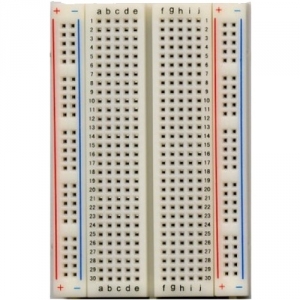 These breadboards only cost a few bucks and are wonderfully handy when you’re experimenting with electronics. 11. 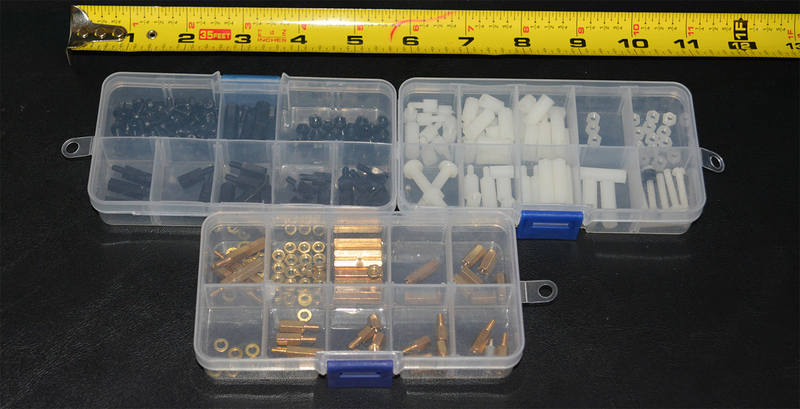 Brass & Plastic Spacer/Standoff — We use spacers (or “standoffs”) to elevate the polycarbonate platform above the rubber tracks and to mount/elevate the electronic boards above the polycarbonate platform. 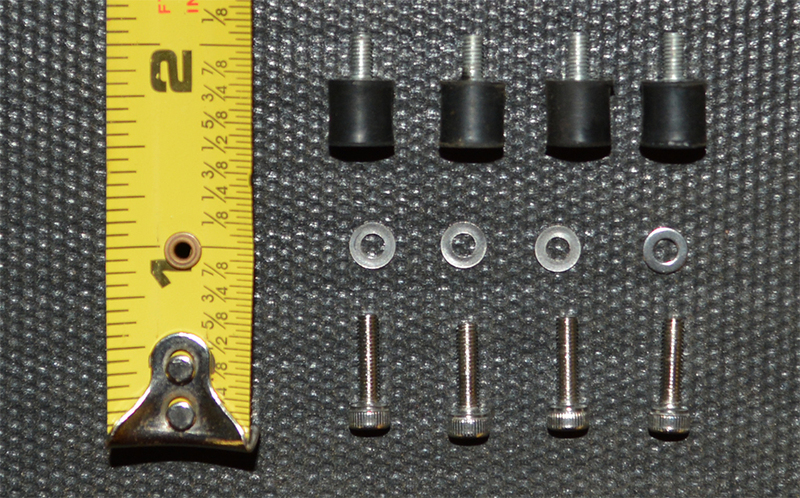 These little spacers are incredibly useful and they won’t set you back much cash. 12. 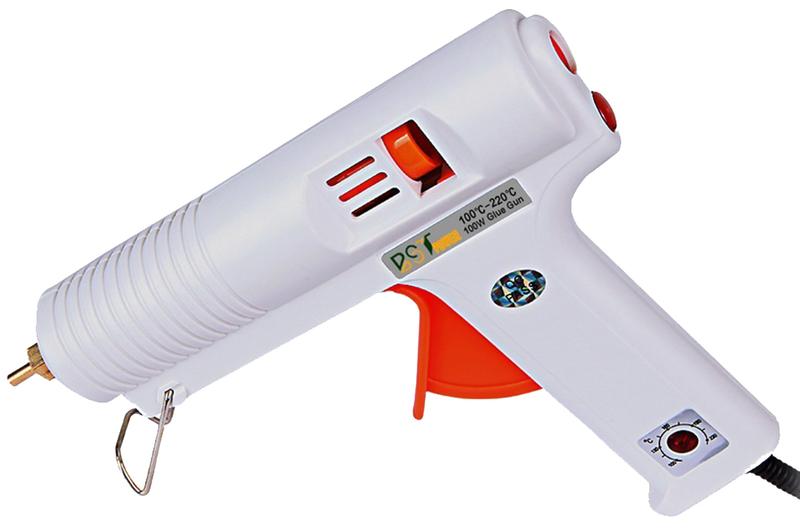 Hot Glue — If you’re an aspiring roboticist and you don’t have a hot-glue gun in your arsenal, then you’re likely losing considerable time. 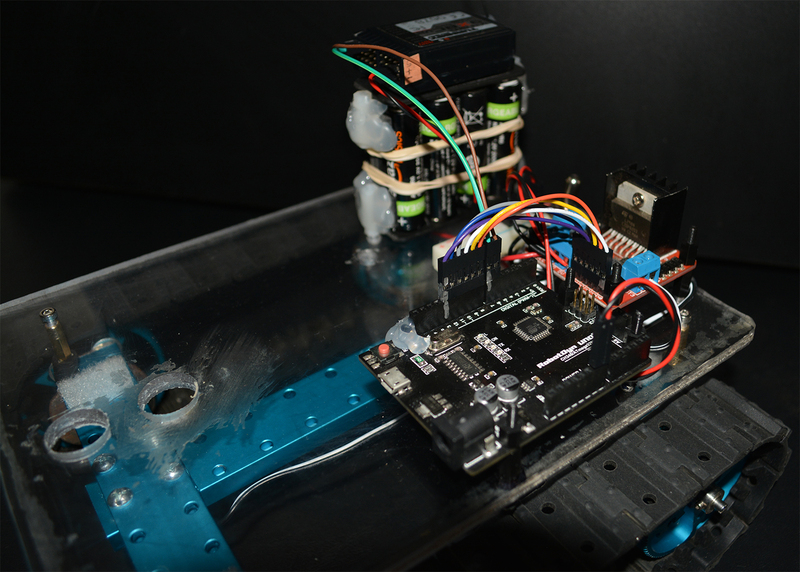 Hot glue is the Duct Tape of Robotics. Hot glue is strong, flexible, bonds to many surfaces (sans metal or anything really slick/shiny) — but most importantly, it’s FAST. When you’re doing a rapid prototype, you can’t wait around for 45 minutes for glue to dry. I buy hot glue sticks in bulk from this vendor. I think that’s an exhaustive list of the materials we’ll use to build Rover 1. Now let’s look at putting it all together. Notice the green-brown 2-wire harness connects radio receiver to Arduino. The 6-wire harness connects Arduino to L298N controller. Bolted on anti-vibration mounts and brass spacers so platform will clear tracks. 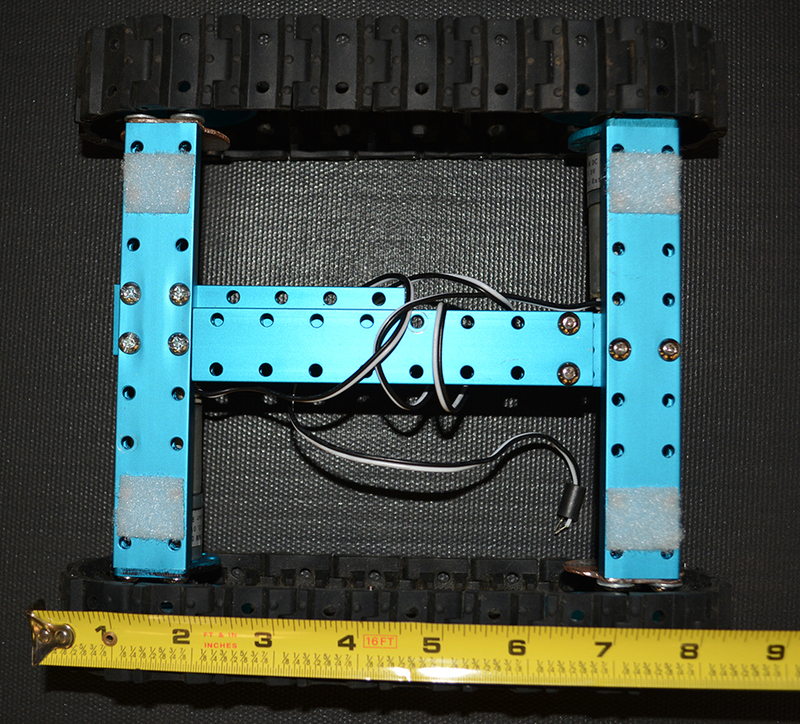 Bolted polycarbonate platform (242 grams/8.5oz) to frame. 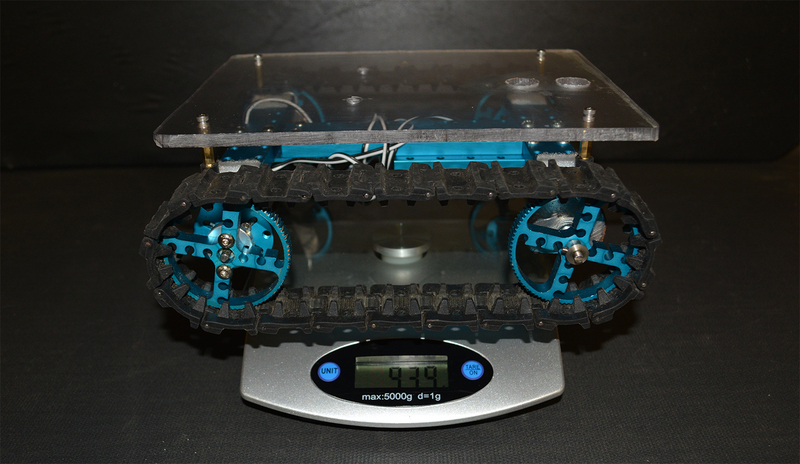 Frame and platform weighs 939 grams (33.1 oz). Added Arduino, L298N controller, batteries and receiver. Drilled holes through polycarbonate platform, connecting to acrylic standoffs with acrylic bolts. 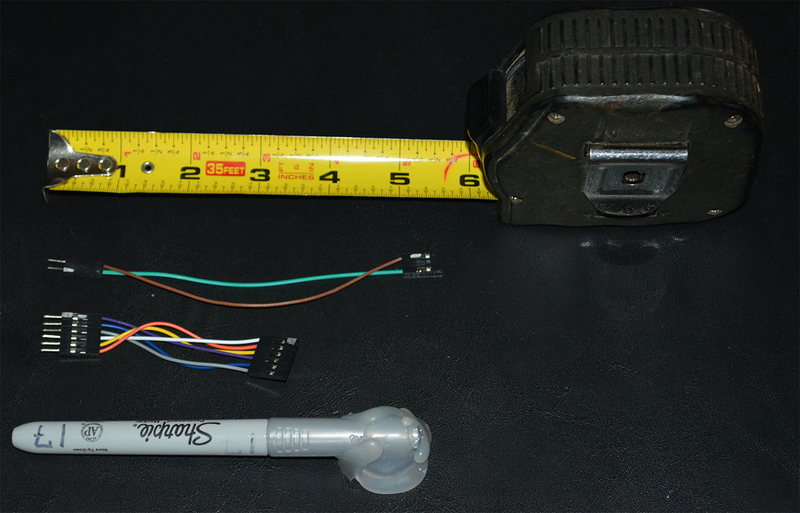 Note that the battery pack wires connect to L298N VCC (via the on-off switch) and GND. We run L298N GND and 5v to the servo rail. Notice how mounting the Arduino/L298N on standoffs allows wires to pass neatly beneath the board. The white and black wire pairs on either side of the L298N go to either wheel motor. 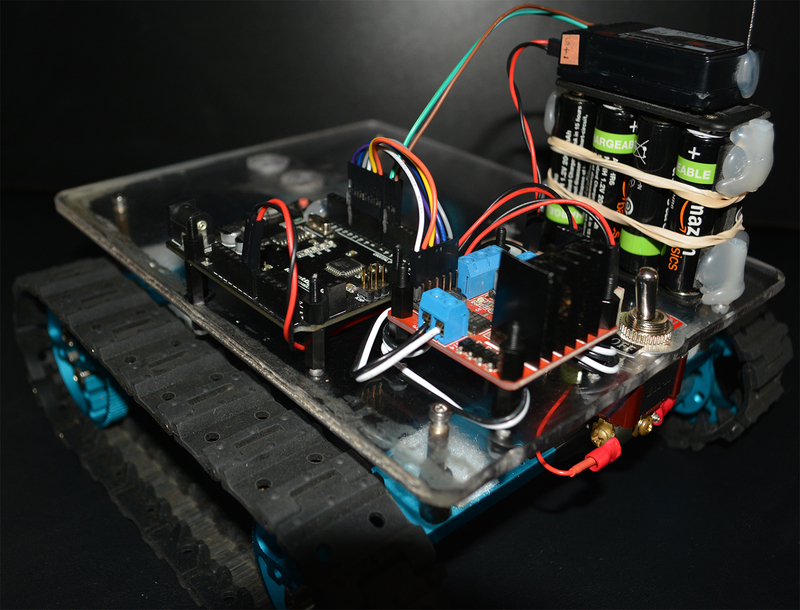 Those rubber bands around the batteries are an eye-sore, but they’ll keep the batteries from flying out when we hit rough terrain. 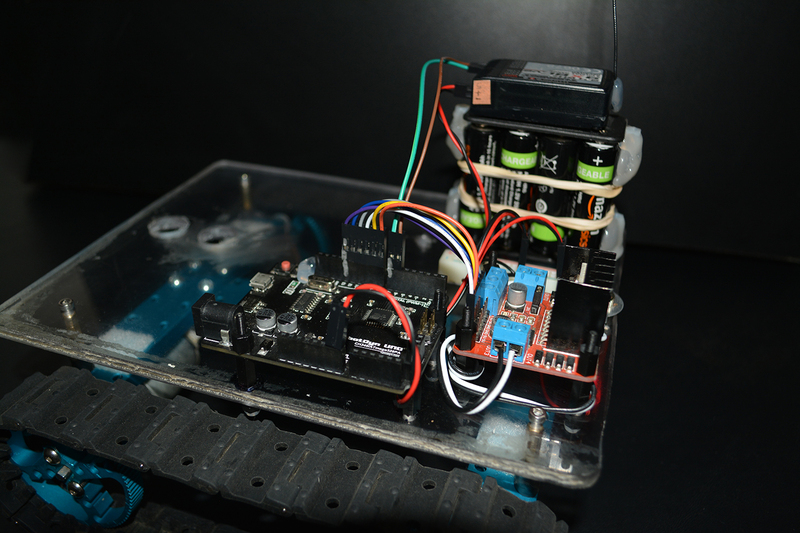 The red/black wire pair on the lower right side is where we power the Arduino from the 5v power rail. The white/black wire pair you see on the left, connected to the blue housing in the L298N, is powering the left motor. 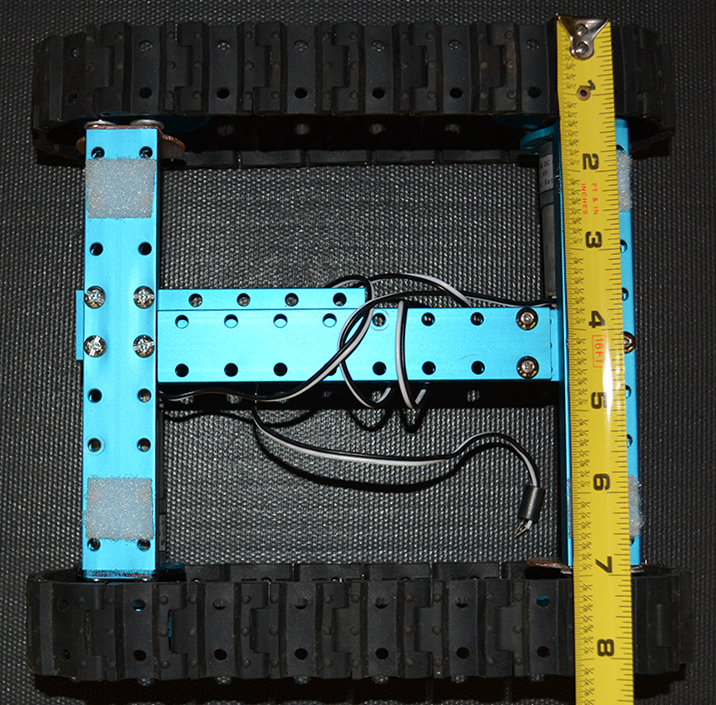 We mounted the RC receiver at the highest possible point to maximize range. These 2.4ghz radios should be good for well over 100m (328ft). 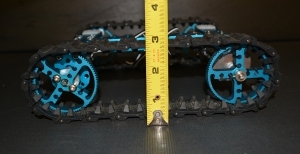 I hope the pictures above help answer most questions you might have about how the rover was wired up. 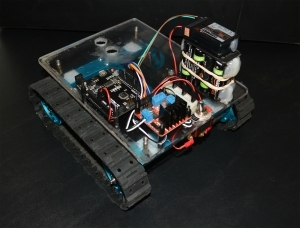 Looking back over the pictures, I suspect you may have some questions about the 6-wire harness that connects the Arduino to the L298N. I took a picture of the harness and labeled the wires on both ends. 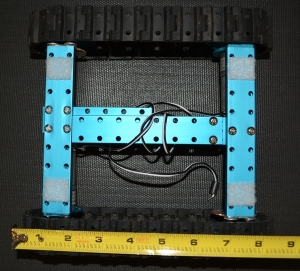 Notice in the picture of the harness on the left that the top is the L298N end. So, for instance, the gray wire on top left connects the L298N ENA pin to the Arduino 11 pin. The blue wire on the top left connects L298N Pin 1 to Arduino Pin 12, and so on. You don’t need a custom wiring harness like this — you can do just fine with the breadboard wires mentioned in the BOM section above. You only need to connect the appropriate Arduino pins to their counterpart on the L298N per the diagram on the left. Notice in the pictures above that we used brown and green wires to connect channel 1 and channel 3 from the receiver to the Arduino pin 6 and pin 7, respectively. 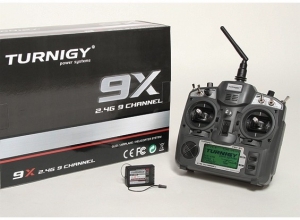 On my Turnigy 9x transmitter, the left stick is mapped to speed (channel 3) and the right stick is mapped to steering (channel 1). That’s a fairly common mapping, but you’ll want to ensure that your transmitter is mapped accordingly. 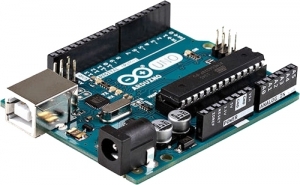 Specifically, whatever channel you’ve assigned to speed must connect to Arduino pin 7 and whatever channel you’ve assigned to steering must connect to Arduino pin 6. That was a fair amount of work! 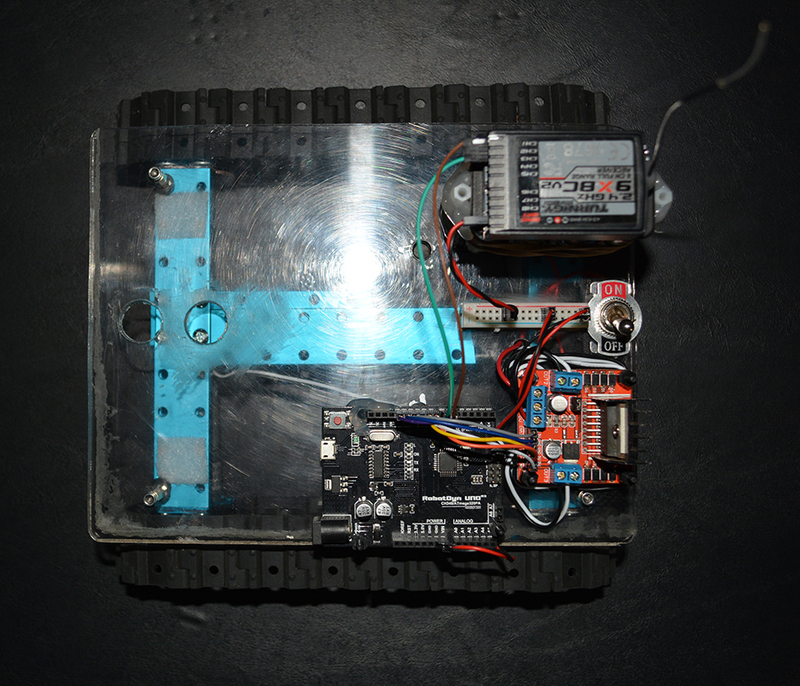 Let’s save the really fun part — the Arduino code — for the next post. If you guys are new to programming, if you’ve been afraid to start programming, or perhaps if you’ve tried a little programming and it didn’t quite gel, I hope you’ll gather your courage and dig in next time we meet. Until then, Peace my fellow roboticists. I recently bought the 100a version of this Chinese built controller to power a electric zero turn lawn mower that I am dreaming of building! I came across this blog while searching for information on how to operate the controller. My intent is to build a ride-on type mower that is controlled, preferably with a single joystick, but possibly with two controls with tank type steering. I will be using two 24v 15 amp wheelchair motors that I scored from the dump! Did you see the article comparing the M60/M100 with the Sabertooth? Gist: get the Sabertooth unless you’ve got a lot of time to spend on the driver. Good luck with your project — hope you blog about it if you get rolling — it sounds like fun. 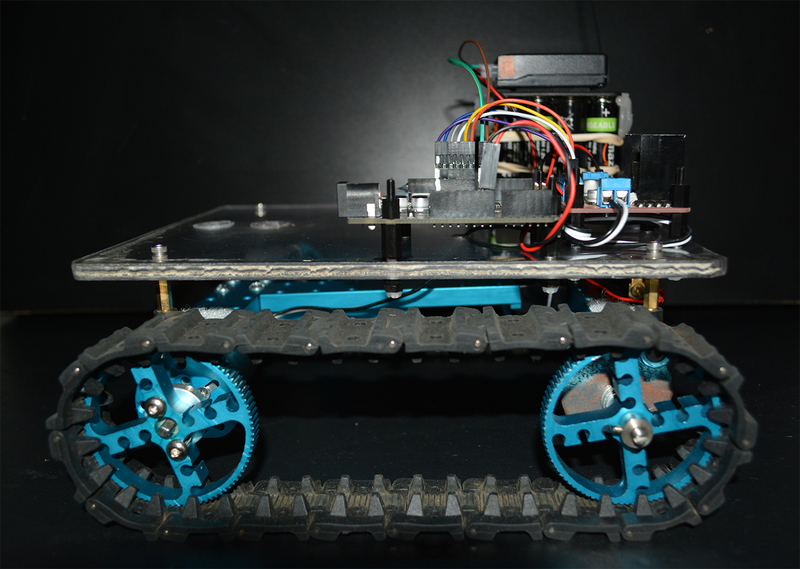 Can the “m60” be controlled with a simple joystick without the complication of an Arduino for a ride-on vehicle? I haven’t tried — the Sabertooth controller performs so well that I’d have trouble spending much time on the “M60”.